No other question about LinkedIn has dogged me more in recent months. Earlier this year, LinkedIn revealed that more than a Billion endorsements had been awarded to some 58 million members. 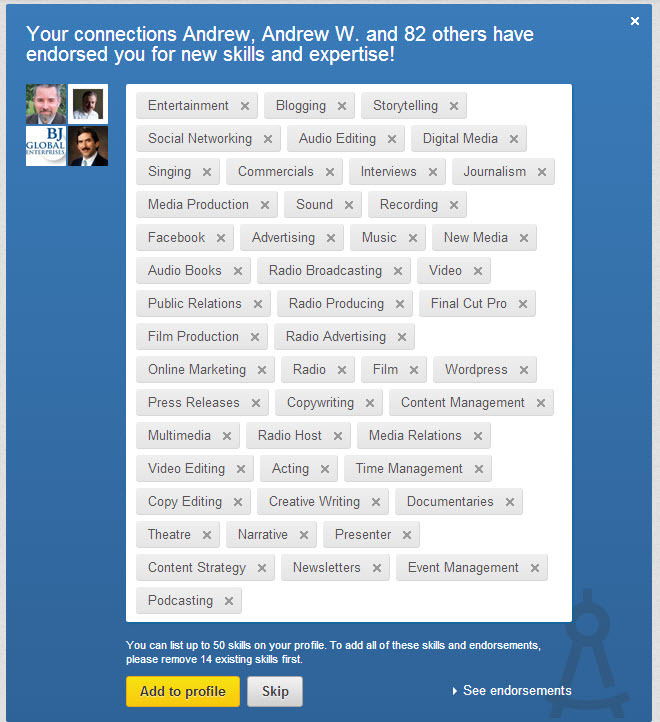 LinkedIn defenders claim endorsements greatly increase your chance of being viewed on the network…but others admit it can represent a false picture of your expertise…and some subscribers mis-use the feature frivolously. Others just see it as screen clutter. I’m undecided on this feature, but leaning more to the side of deleting this from my profile. On your home page, click on the profile tab at the top, and then “edit profile” from the drop-down. 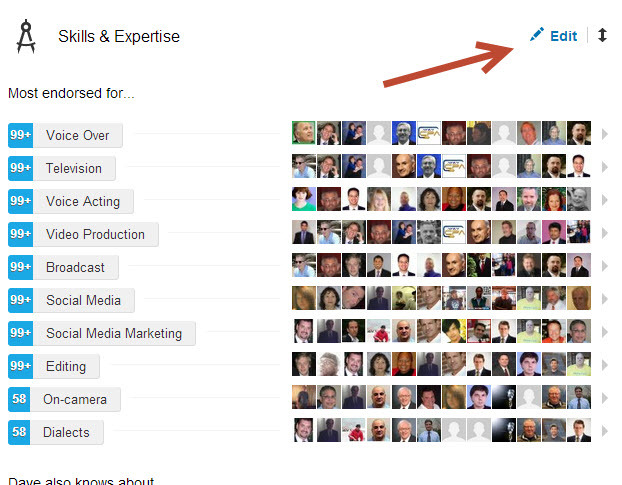 Scroll down to the “Skills and Expertise” section and click on that pencil icon on the upper right (see red arrow). Again, from the drop-down menu, choose “No, do not show my endorsements.” That’ll remove the section from your home page. You can also just edit the skills and expertise that appear in this section. Again, click the pencil icon. An “X” appears next to each skill, and you just toggle it on or off to select the endorsement or not. I’ll be dishing tips about LinkedIn and other social networks this coming Tuesday on a Julie Williams’-sponsored webinar. Here’s where you can read more about it, and register: http://www.voice-overwebinars.com/featured.html.